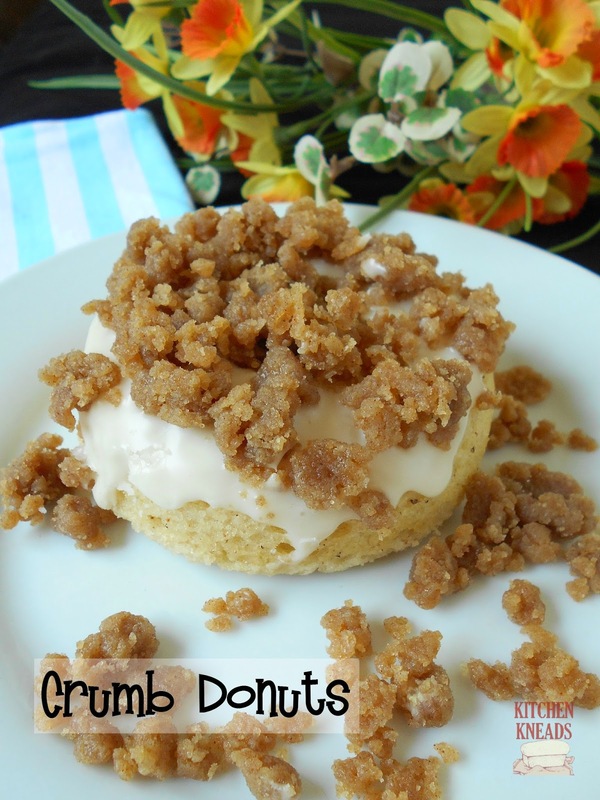 I love crumb cake and I love donuts, so why not combine the two? Remember our delicious baked Strawberry Donuts? They were so good and I had so much fun making my own baked donuts, I’ve made different kinds of donuts over the past while,but these crumb donuts were delicious enough that I have to share them with you. So grab yourself a donut pan and make a batch of these today. Stir the wet ingredients into the dry (but don’t over-mix). Divide the batter between the 6 spaces in the donut pan and bake for 8-9 minutes. Add the pan of crumbs to the oven at the same time. Keep an eye on the crumbs–the mixture will spread out like one giant cookie. Make sure it doesn’t get too dark brown. When the donuts are done, the surface of the donuts will spring back when pressed gently.